Today's guest blogger is Jamieanne from The Cupcake Review, who we've linked to many times, and she's sharing with us some Christmas cupcake favorites. Be sure to visit her blog for a coffee buttercream recipe, a red velvet cupcake recipe, and much much more! I would first like to thank the girls of Cupcakes Take The Cake for including me in their guest blogger lineup. I am so excited to be a part of this. I've decided to write a post suggesting that everyone bake cupcakes for their friends and family for the Holidays, and am also including a few of my favorite Christmas cupcake photos. I, myself, will not be doing any Christmas shopping this year - I'm going to be Christmas baking. 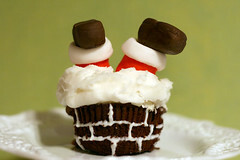 That's right, I'll be giving cupcakes for Christmas gifts. I know my family will enjoy their gifts so much more knowing that I took the time to make them rather than buy them. Originally uploaded by Just Cupcakes! Giving cupcakes as Christmas gifts is also a great idea for those people whom you have no idea what to give, or for the person who already has everything. 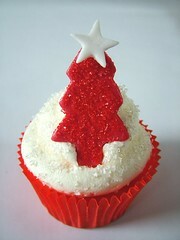 A little tip though - buy your Christmas baking supplies early, way early, because they sell out fast! I bought some great holiday cupcake supplies from shopbakersnook.com - cupcake boxes, sprinkles and liners (see them in my Flickr photostream). I can't wait to get started on my Christmas cucpakes! I'll be making 4 different cupcakes - gingerbread cupcakes with vanilla buttercream, topped with a mini gingerbread boy cookie; red velvet cupcakes with vanilla buttercream and holly berry sprinkles; chocolate cupcakes with mint buttercream and chocolate ganache; and chocolate cupcakes with chocolate ganache frosting. My cupcake menu is, however, subject to change. 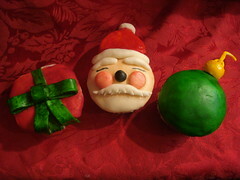 Pictures and recipes will be posted on my blog, The Cupcake Review, after Christmas. Are you baking sweet treats for Christmas this year? Merry Christmas!